When the autumn leaves begin to fall, it’s time to winterize your vehicles. After an inspection by your mechanic to insure your automobile is running properly, replenish all the fluids and then clear the sand and beach balls, golf clubs and baseball gloves from the trunk. Replace them with the items below and you’ll be ready to take to the road this winter. 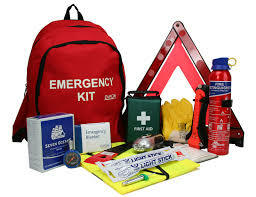 Emergency kit – Auto part stores sell these or you can compile your own. Include a few handy tools like screwdrivers and pliers, jumper cables, road flares, flashlight with fresh batteries, and reflective triangles. First aid kit – Besides the usual items, this is a good place to store some spare change and a few random snacks just in case of delays. Don’t forget a box of tissues for those nasty winter colds. Traction – To proceed in an icy situation, you may need some ice melt, rock salt, or kitty litter. If you are prone to encounter extreme snow packed conditions, don’t forget the tire chains. Ice scraper – These often get broken or lost from one year to the next, so make sure you include one in your car before bad weather hits. Blanket – In case of breaking down in the cold, a cozy blanket will help keep you warm. Also include a change of clothing, especially socks and gloves for when yours get wet and soggy. Pack them in a plastic bag to keep them from getting wet from other items in your trunk like sleds or a snow brush. Finally, store relevant emergency numbers in your phone and keep it charged. Keep your tank full and have a safe winter.